Group lessons have lost favor to private and semi-private riding lessons but they have a lot of value to students and instructors. One of the reasons soccer is popular among kids is because it involves other kids. Just drive past a soccer field with a 7 year old kid in your car. You’ll notice that their eyes don’t leave the hoard of kids who look like they’re having a great time together. Kids are social creatures. They want to be with other kids. Adults may carry more baggage learned from life lessons, but most of us look for a group that is somewhat like ourselves, just like we did as kids. Riding is a social experience. People who take lessons and ride want to connect with other people who take lessons and ride. Group riding lessons are one way to fill the social needs of the horse lover. Even adults look forward to riding together. 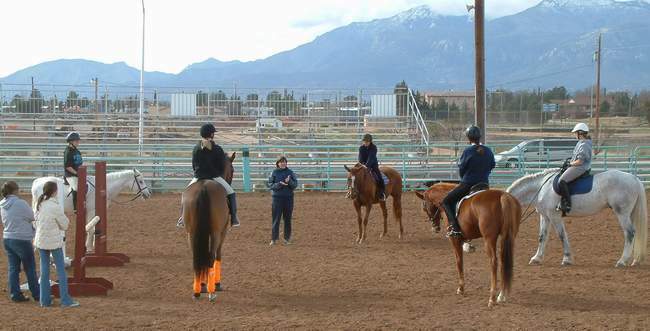 Group instruction, taught by a competent instructor, is a better teaching pattern for most people (and horses). Because the instructor’s focus moves from student to student, rather than resting on one person for the entire ride. This provides smaller information bites which are more easily absorbed. Plus not having the instructor focus on them relentlessly allows the student the opportunity to make adjustments and corrections themselves. And even though the pressure is off for a short time period, the instructor is still aware of what is happening with her student. For some people, riding snaps into place much faster when they can see what they are trying to achieve. Group riding lessons provide the instructors with demo riders. Take teaching diagonals as an example. Instead of exhausting the “rise and fall with the one on the wall” ditty and rather than your students struggling looking at their horse’s shoulder to try to coordinate it with their posting, you can let them watch each other. The first part of learning diagonals is seeing the relationship between the horse’s shoulders and the rider’s posting. Have one rider watch the group and I say, “Tell me which shoulder comes back as this rider sits into the saddle.” It works every time because it’s that old “a picture is worth a thousand words” theory at work. The visual tool works. And when they see that one of their peers can achieve something, they know they can too. So I guess I have to add that group lessons give students confidence. Games are an excellent way for riders to put their skills to practical use. There is an endless number of games that an instructor can use; from dropping rocks in a pail to relays over fences. These games can all be used in private lessons as exercises but they are so much more fun when you can form teams. In the same sense that group riding lessons give students confidence, group lessons also add the challenge factor. When peers ride together and they see one another achieve, that nudge to do it better seems to find its way in. One of the most delightful lessons I have ever witnessed was with Molly Sivewright. Mrs. Sivewright is the author of both “Thinking Riding ” books, as well as a book on lunging. She is the founder of Talland School of Equitation in England and is a Fellow of the British Horse Society. I met Mrs. Sivewright at a dressage clinic in Kansas. In a matter of minutes, through the use of school commands, Mrs. Sivewright had 8 dressage riders divided into two circles, going the opposite direction and changing circles smoothly on command. Believe me when I say, that this didn’t start out pretty! These horses and riders were used to riding alone. But after a few minutes, this group looked like an experienced drill team. I’ll bet those riders will never forget Ms. Sivewright’s lesson. Working in file and trying to keep the correct distance from the horse in front of you is challenging for students. Adding changes of rein, circles, and transitions on command gives students a new way to work on their skills. I call this “learning through necessity”! For Pony Club camp, I hired a man who’d ridden with an Andalusian drill team that exhibited all over America. I had my doubts that the older, higher rated members would be comfortable using their hot thoroughbreds for drill riding, but I was wrong. This instructor’s classes were the thrill of camp for all levels that year. Let’s face it. Travel time and cost are a big deal to everyone these days. It’s a bonus anytime moms can take turns transporting kids, and riding lessons are no exception. Group lessons are an important part of an instruction program. Becoming a group instructor takes practice and you’ll have to master the multi tasking skill but the benefits to your business and your students are worth the effort. Group lessons have benefits that range from progress, to social, to use of time, to finances, to fun. In the long run its the progress and fun that will keep your students coming back for more.